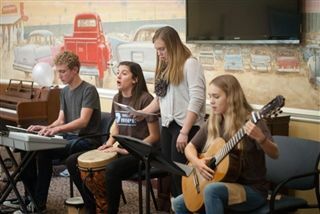 Upper School Service Learning group Notes of Hope performed for residents at the ActivCare assisted living facility in Bressi Ranch last month. The group played saxophone, french horn, keyboard, guitar, and drums, and sang along to a variety of classic tunes designed to bring joy, prompt memories, and inspire movement. After the performance, students had the opportunity to visit with audience members, many of whom eagerly expressed their appreciation for the entertainment and shared stories about how music has impacted their lives.